“Papa said Jesus did His best work when He reached down, under-the-water’s-surface and pulled a person up. They were drowning. They’d already give’in to the idea they were gonna die. They’re workable. That’s the kinda house I lived in: Papa’s 2-Toned Wet. Papa said when Jesus tried to work with people on top of the water, they weren’t easy to work with. They’s too much of themselves. Those people who’d gone down – were stiff – well …somebody else had to deal with them. Kinda like fishin’. Papa liked wet-flies. He said fishin’ right ‘neath the surface was where you got a serious fish. Fishin’ on the top, that was easy. T’wern’t that hard. Fishing way down on the drag-bottom, that weren’t hard neither. Sorta like chuckin Kentuck’chuck’bait … or, what other folks called, fishin’ with dynamite. But gettin’ the fish on a bite, right under the surface – at the line between their world ‘n ours – that was real fishin’. That’s Papa’s 2-Tone Wet. Well, part of it – at least. Growin’ up in our family, there was rules, ‘n there was rules. Not many, but there was rules. One rule that Papa had – and no one dared to break it; least whys not when he was ’round; or kept right secret like, soes he’d be most likely not t’ EVER find out; was simple. Fishin’s not about draggin’ the bottom, rakin’ the surface, killen or braggin’. Fishin’s ’bout one thing – and one thing only – fightin’ chance. The fish gives you a fightin’ chance when you come to the water, to do your ‘fishin’ thing’ – whatever it be. So, h’it’s only fair that you give the fish, a fightin’ chance as well. That’s why he only used, the method he called, The 2-Toned Wet. H’it weren’t no secret that my Papa liked fish and fishin’. But it was a hugemongeous secret about how Papa was able to be so lucky at turnin’ fishin’ into catchin’. Most folks thought he has some sort of deal with the water-spirits that helped him with catchin’ fish. But Papa just laughed. Laught good’n’hard …and loud… when he heard this said. Papa said the only spirit he knew of – anywheres near his fishin’, came from a Ball Mason quart jar. And he said most of them spirits were damned liars. Papa no longer casts the 2-Toned Wet fly over the creeks of our home area. But, his shadow still casts quite a line over folks in these parts. Folks done asked ’bout Papa’s fishin’ luck and how he came to be in possession of his knowledge of 2-Toned Wet and I just ignored them. Then –I begun’ta realize that my bein’ all quiet’n’such ’bout Papa ‘n his gift, caused me to lose touch with Papa and his fishin’. That’s somethin’ I don’t ever wanna lose touch with. So, I finally decided; since Papa is now only fishin’ in our memories; to write down what I know about Him and the 2-Toned Wet. The eLITHOGRAPH, Pappa’s Two-Toned Wet, is an image size – 10″ x 8″, watercolor style image when printed. There are four panels of PTTW images. The image shown above is the Barbless version. There are three panels displaying the other versions. Shown below in the bar-panel (from left to right) you find the Club, Button and Hookless, styles of the PTTW wet-fly. This fly and the story came out of an influential article, written by the well-known, and highly-respected Canadian-born, (now residing in the Bahamas) fly-fishing and TV personality of the popular fishing show, What A Catch, Kathryn Maroun. Kathryn and I had started an online conversation, on Facebook, a few months before the ‘article of influence’ was published. Our conversation of origin was over her current struggle with Late-stage Lyme disease. During her months and months of treatment, pain, agony and suffering, she began rethinking the whole issue of pain. And in this she began rethinking her position as a ‘hooking angler’. Read Kat’s story to get the full-story and her message. Watch the video: The Evolution of an Angler. Read the article in WOW online. The upstart of the video and conversations with Kat was, her disclosure of a new-found preference for the use of a ‘hookless-fly’; a fly without, not only a barb, but NO POINT! As I told Kat, I had been using a ‘hookless fly’ technique for the better part of 15 years. I had developed this in response to what I was seeing as too many injuries – leading to death or greater potential for fatal release – of fish, through improper handling, that were intended to be released as catch-n-release. So, instead of hooking the fish, I would cast a fly that has no hook to ‘hold the fish’. The only ‘catch’ I would have would be the length of time the fish retained possession of the fly in its mouth. Thereby giving new meaning to the old fishing mantra, ‘The Tug is the Drug’. 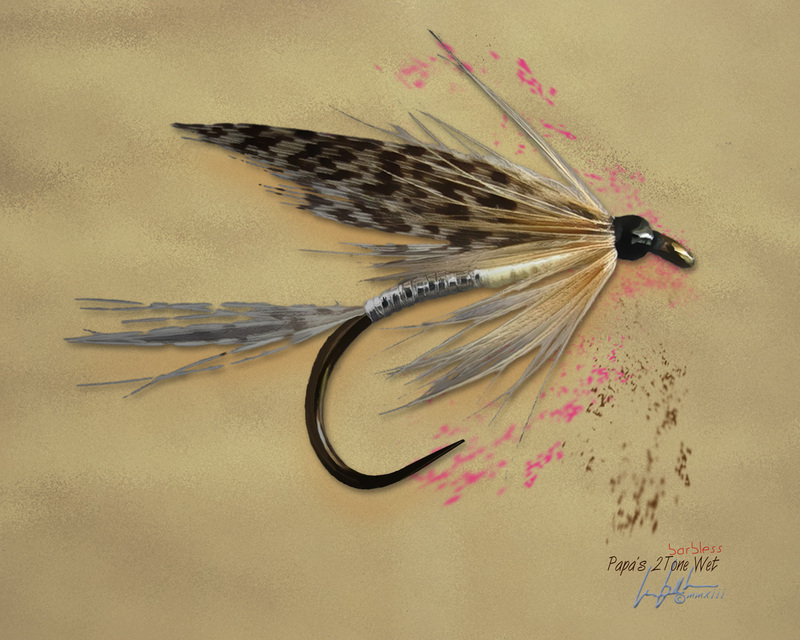 As part of the story, Pappa’s Two-Toned Wet, I have introduced 4 types of hook/bend designs for fishing a barbless to near to total-barbless fly.f Thank you Kat for the inspiration that brought about Pappa’s Two-Toned Wet!